help.nextcloud.com is for home/non-enterprise users. If you’re running a business, paid support can be accessed via portal.nextcloud.com where we can ensure your business keeps running smoothly. 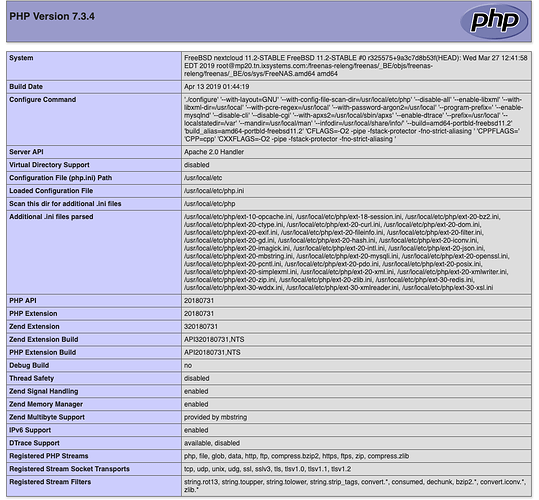 The issue you are facing: I successfully upgraded the PHP version to 7.3 as evidenced by the PHP Info, but NC is not responding. Examination of the httpd-error.log reveals an error connecting to the database. With the updates of PHP the modules are removed. As a result you need to enable/ re-install mandatory modules again. Please check the installation guide for that. Actually J-ed I did search, and this is a completely different issue. My php-info reveals that Apache IS using the new version of php. My issue is how to restore connectivity to MariaDB for NC. I also had installed all of the php73 modules that were installed under php70, with the exception of mcrypt, as it no longer exists. Again, my issue is re-establishing the connection to the NC database. Are there any messages in the system logs about the connection failures to the DB? While I had php73 installed, the php info as served up by apache24 is attached. I find this very hard to read on the screenshot and I can’t search for strings unfortunately. I believe this was/ is a quite minimal setup and most of these modules are required for Nextcloud to run properly without warnings in the Overview. I think the message clearly states that the driver couldn’t be found. Afaik the required module is named “php7.3-mysql”. Make sure it is installed and correctly configured. You guys were absolutely correct on the missing module. In my case, on Freebsd, the module I had missed was named “mod_php73.” Once I corrected that, PHP 7.3.4 is running within Apache, and Nextcloud is running correctly as well. The reason I started an upgrade to PHP7.3 in the first place was a belief that PHP7.0 was creating a problem with my ability to run pkg upgrade. The issue that I had was that a pkg upgrade was trying to remove Mariadb, which is needed for NextCloud. After upgrading to php7.3, the pkg upgrade to libreoffice 6.2.2_3 is trying to install mysql56-client: 5.6.43 which is incompatible with Mariadb because it installs in the same file location as the mariadb client. Therefore, the original issue that I was trying to resolve is still present. For the time being, I have locked mariadb within pkg, but I would prefer to maintain the software through the pkg management and need to find a fix for this long term.